Permatex 3.78-Litre Fast Orange Fine Pumice Lotion Hand Cleaner with Pump is a biodegradable, waterless, petroleum solvent-free hand cleaner that contains no harsh chemicals, petroleum solvents or ammonia that can sting cuts or abrasions. Pure, fresh-smelling natural citrus power does the cleaning. 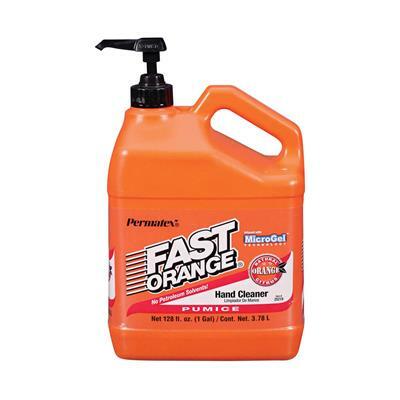 Permatex 3.78-Litre Fast Orange Fine Pumice Lotion Hand Cleaner with Pump is a biodegradable, waterless, petroleum solvent-free hand cleaner that contains no harsh chemicals, petroleum solvents or ammonia that can sting cuts or abrasions. Pure, fresh-smelling natural citrus power does the cleaning. Fortified with aloe, lanolin, glycerin, and other skin conditioners to soothe raw, rough hands. Fine Pumice deep cleans the toughest dirt. Works great on laundry stains (smooth lotion only), scuff marks, tile floors, pet odors and many other household cleaning needs. DIRECTIONS FOR USE: Rub hand cleaner into dry hands (use no water) until dirt or grease is dissolved. Wipe dry or rinse with water.